Decades from now, Arsenal historians might look back on this period in Arsenal history as the Acronym Wars: The WOBs against the AKBs, with a few others thrown in – BSM, AST, AAAs, you name it, someone’s made up a TLA for it. But why is there a division between WOBs and AKBs? What don’t they like about each other’s opinions? What this all boils down to is quite simple. One side laud Arsène Wenger as a genius for keeping Arsenal in the top four every season (so far), while the club has gone through a stadium move of the kind that has crippled other clubs who’ve tried to self-fund. The ardent Wenger fans go so far as to say ‘he built the stadium’. They imply – nay, insist – that without him, Arsenal would have been sunk if the club tried to spend £400m on a new stadium AND maintain a relatively successful team – no trophies admittedly, but top four, the odd final and continual Champions League participation. To them, Arsène Wenger is an unparalleled genius; the greatest manager ever. They say, look: we were successful before the stadium move, we won trophies. Since the stadium move we have won none. But we have the same manager, so therefore, they infer, the clear reason for the lack of trophies in recent years is the stadium. The spending on that hampered the manager so much that we have been less successful on the pitch. But Arsène is a good egg who refuses to blame the Board, so he never says he was hampered by lack of funds, and the Board have always maintained that funds have been available. The AKBs don’t really agree with the Board (this is a dilemma for the most extreme of them, as they want to believe everything the Board tells them). The AKBs believe that one day Arsène will come out and tell The Truth: he’d have won many more trophies if he hadn’t had to scrimp and save just to buy Bendtner some new hairbands. At the other end of the Arsenal-supporting scale there are those who say no other manager would be indulged like Arsène Wenger has been. We have gone eight years without a trophy – anyone else would have been sacked long ago. Yes, we have moved stadiums, but look at all the money he’s spent on wages for dross. Who else would be allowed to do that? What other manager dictates every bit of spending in a big club like Arsenal? No one. And, say the WOBs, it wasn’t the Board who forced Arsène to sell Henry, Vieira, Fabregas or anyone else. They’d had enough of him and wanted to go. Look at his overall spending: wages are, and always have been, very close to Man Utd’s, but without any of the success since 2005. We should sack Wenger now, he’s been holding the club back for years with his ridiculous policies on trying to win with kids. He’s spent loads of money. He could have spent loads more if he wasn’t a stubborn old fool. Obviously most of the calls for Wenger’s sacking have been more muted this season – no one is realistically going to expect the manager of the team leading the table to be sacked. And equally obviously there are a lot of Arsenal fans in the middle of the spectrum who recognise a great manager, but also recognise his limitations. People who appreciate subtleties and shades of grey, and the many factors that contribute to success or failure. People who believe it’s possible to support a football team without blindly assuming everyone who works for the club knows best every time on every subject; such fans might therefore criticise sometimes without that actually affecting their support. If you’re one of those (the majority), I’m not trying to wedge you into one of the extremist camps, but believe me both camps are well populated. Back to the point in hand: AKBs say Arsène’s a genius, because he’s been hampered for years by the stadium move. WOBs say he’s not been hampered, he’s just a manager who is past his sell-by date. But which of these is true? 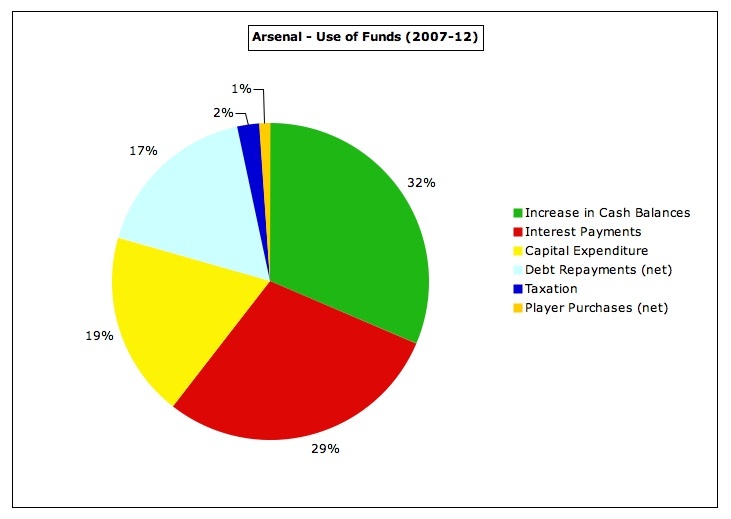 How much has the stadium move really prevented Arsenal from spending? It cost about £400m, but it brings in a lot more income than Highbury ever did. Well, I’ve had a look and (with some help) worked out some figures to quantify the ‘stadium effect’. Tomorrow I’ll reveal all. Gonna treat us to some regression analysis tomorrow, Mr Wall? How silly of me – I was forgetting, you know everything! I don’t disagree with Kieron (Swiss), but the blogs you’ve linked to are answering different questions to the one I’m talking about. I can’t say I would say the same for you, not even in jest or sarcasm. Don’t dish if you can’t take it. And dont harrass commenters for no good reason either. “No good reason”! Ha ha, you kill me! I hope we will be aiming to move the needle of discussion beyond here as opposed to regressing. There should be no argument. Over the last decade, let’s look at premiership points won for each million pound spent. Forget Chelsea and Man City, their wealth brought them both less than two points for each every million spent. What about the so-called ‘best manager ever’? Well Fergie did much better gaining around 6 points for every million he spent. Sadly he was way behind the second best manager in the prem who achieved 25 points for every million spent. Oh and Wenger? Well some idiots still think AW is crap (they’re just hiding under their stones at the moment waiting for a slip so they can campaign for him to be sacked). What they need to stop and think about is that he gained 44 points for every million pounds spent. Almost 8 times as many as the so-called ‘best manager in the world’ and eight times more than the Spuds. And we now own the best stadium in the UK. Presumably you’re talking about pounds spent on transfers only, not on wages? Football doesn’t work like that. If you’re going to work out points per pound, you need to use total spend. Perhaps. But isn’t the lack of transfer spending in some way linked to both the argument that there were financial restrictions, and the criticism of Wenger? Or you could criticise him for actually following the same logic as you and prioritising the spend on wages. Difference being that you use this logic to diminish his achievement. AKB, AAA, whatever. We’re back to the 8 years again and talking about acronyms because you chose to bring it up. Wenger isn’t infallible and so, increased spending, even pushed to the limits that Arsenal could achieve, wouldn’t have offered a guarantee of a victory against the money of the oilers and ManU. As such, it probably wasn’t worth spending that extra money to achieve the same. The risk wasn’t worth it. Better to consolidate your position and launch an offensive when more factors align in your favour. Doesn’t have the drama and appeal of going out in a bloody mess though. And so they were, and are, accused of accepting failure. Individual decisions might have proven wrong (which doesn’t mean the decision was wrong at the time it was taken), but overall strategy, of Arsenal and Wenger, was completely sound, and despite the lack of trophies, largely successful. It was also way more ambitious than given credit for, because the scale of ambition went beyond the short term. Everything is linked, but to claim Arsene is X times better than Fergie based solely on transfer spending is daft. There’s a pot of money and the manager decides how to spend it. However, that isn’t really the subject under discussion in this case. The subject is whether moving stadiums caused a problem, not what Arsene did with the money he ended up with. I can’t be bothered to do all the maths for you but if you really think we spent 8 times more than Man U on wages, I think you’re misguided. And in answer to your second point, I didn’t say Wenger was 8 times better than Ferguson (you chose to make that claim to try and make your argument look better in the absence of facts). What I stated were pure facts i.e. AW gained 8 times as many points as Fergie. I’m happy to debate things but please use some facts to substantiate your AAA beliefs in future. If you want an opinion, yes I do think AW is a better manager than Fergie based on the concept that Fergie has probably spent more on bad signings than AW has had in his budget and I don’t believe Fegie could have hacked it with the sort of budget AW had. In addition, having been in charge of the richest club in the world (until a few years ago) it’s very arguable that so few Europan Cups is a considerable under achievement…………….but that’s just an opinion. Ah, I’m in the AAA now, am I? Marvellous. I’d like to see you substantiate that, whatever it means. I don’t think Arsenal spent 8 times as much as Man U on wages, that would be silly. But perhaps you can explain the point of saying Wenger gets more points per £ than Ferguson, and what figures you are using to calculate it. Because saying he gets 8 points per £ for each 1 of Fergie’s is as silly as saying Arsenal’s wages are 8 times as big as Man Utd’s. I would be very interested to see if the conclusion is that Arsenal really weren’t hampered by the stadium. I’ll approach it with an open mind, but it would have to be some pretty compelling evidence to turn around the accepted version of money being an issue. I don’t see where Mike claimed Wenger was x times better than Fergie. Also, I know that wasn’t your main point, but I think transfer spend over a long enough period eliminating some outliers, will also have some major significance on a team’s performance. Losing players every year or so means a side has to be constantly rebuilt. Regardless of the money that comes in that is tough to do. On the other hand, if you sell just one player for 80m, then it is not really a rebuilding job, and so, although your net spend might be the same in both cases, the first is the tougher situation to deal with. Stability is very important at the club, and although a lot of the flux came as a result of Arsenal’s policy, it was still the better option in my view. And Arsene Wenger did very well to cope with that. “What they need to stop and think about is that he [Wenger] gained 44 points for every million pounds spent. Almost 8 times as many as the so-called ‘best manager in the world'”. So he was saying Wenger was almost eight times better than Ferguson. Looks fairly plain to me. Looks to me like he stated that he won 8 times more points per million spent. Reasonable assumption that he meant transfer fees alone. Also reasonable assumption that he meant Wenger has done a better job than Ferguson in monetary terms. Not reasonable assumption that he was saying Wenger is 8 times better than Ferguson. Looks fairly plain to me too. If he’s saying – which he is – that Wenger’s performance (on his flawed criteria) is eight times better, then he is saying Wenger is eight times better. There’s no practical difference between those statements. No..He’s simply saying that Wenger’s performance within a set criteria is 8 times better. The following jump in logic, which you attack, actually comes from you. Not from him. What wouldn’t be flawed criteria? Trophies? Number of years? Wage and transfer spend? None of it is anything other than a set criteria, all of which are flawed. By your rationale there can never be any comparative study. Nowhere did Mike make the claim that Wenger IS x times better than Ferguson. He said Wenger DOES x times better and specified how….. You’re just attacking a straw man of your own creation. b) I think Walcott’s speed is an asset which Bergkamp couldn’t offer, making Walcott more valuable. Now you could say that Walcott actually runs only twice as fast as Bergkamp, not thrice..(Ie..challenege the facts). But if you suggest I was saying (a), then that is completely different to what I was saying- Practically and intellectually. Your analogy doesn’t stack up. All managers try and win points, it’s essential; not all players need speed. You need an analogy where the objective for players is identical for ALL players. Firstly, how does that matter? The analogy wasn’t about the absolute need of any criteria. In fact, I clearly said that the validity of that criteria (or how flawed it is, to use the negative connotation) is completely up for debate. The analogy was to show you that there is a clear practical difference in using an illustrative example specifying one performance criteria, and extrapolating that to quantify the global performance. Something you claimed had no practical difference. The universal desirability of the criteria changes nothing in that sense. Secondly, all managers try to get points, but all managers don’t try for the same amount of points, so it’s not like that is an absolute either. However, forget the analogies if you don’t like them. You were ascribing statements to Mike that he did not make through any reasonable interpretation of his words. Straw men make for excellent targets, but poor debate. As do intransigence and deliberate obfuscation. “All managers don’t try for the same amount of points” – yes they do, though their expectations and results may differ. Ever heard of ‘playing for a draw’? More to the point, you are obfuscating again. Nobody plays for a draw in preference to a win. Ok fine..Your irrelevant twists of logic caught me out there. I addressed an irrelevant, but correct point, incorrectly. Happy? But what have you proved? That you’ll stand and fight and squirm around till someone else makes a slip instead of accepting that what you said was wrong? The whole analogy thing still worked before you decided to extend it to say what you wanted it to say. Which is what you did with Mike’s facts as well. I’m sensing a pattern here. I have been a regular critic of AW over the years. I have always directed that criticism at his footballing decisions and have never been personal nor I hope rude. While he may well have been a driving force behind the development of the new stadium I have always insisted that the managers job was to manage the team. Arsenals lack of success over the last eight years is down to the manager, no one else. To suggest that the stadium build affected his budget is nonsense. He remained very active in the transfer market and made money on some of our best players at the time. He also made some poor acquisitions. Some comparisons with our friends at Man U might be worthwhile. During the same period they managed to win several league titles, a couple of Champions league titles plus an FA cup or two. This despite a take over that plunged the club into huge debt, caused a rift among supporters that led to the formation of a new club and all while paying off the cost of two previous stadium developments. This happened because Ferguson focused on the football and demanded funding for team improvement. He too made some bum signings but still managed to be successful. Ferguson’s bullish and sometimes ignorant behaviour bullied his teams to succeed. I would far prefer Arsene Wengers style of management any day but I would like him to be more forceful in his dealings with the board and players. Simply put a manager should manage and leave the other stuff to others. Take in on a factual basis rather than random opinion. Look at the numbers: the club’s investment choices and desired risk profile affected Wenger’s transfer budget. Spend – and risk – less in total invest on players, accumulate younger players with potential sell on value. Basically in order to offset the risk of buiiding and paying back for stadium, the ownership chose to run an “Ajax” for a while to balance out the risk. It’s all about choices and priorities set by owners. You’re right, there is a huge chasm between the two differing opinions, and the answer probably lies somewhere in the middle. Arsene Wenger isn’t the best, but he certainly isn’t the worst either. He has wasted huge resources, and continues to do so, Diaby and Bendtner being the two obvious examples, and in any other walk of life he would have been sacked, if not imprisoned. But football has this sycophantic attention which means it exists outside of ‘normal’ society, which is why un-skilled journeymen like Robbie Savage and Alan Shearer have no conscience about stealing money from the same cash-cow that has given them far too much already. It’s the reason failed managers such as Martin O’Neill, Roy Keane, Sparky, Sven et al, all get lavish praise heaped on them for doing nowt, and keep getting rewarded with huge multi-million contracts. It’s why Roy Hodgson is national team coach, even though our brand of football hasn’t altered for decades. Hodgson is the perfect journeyman, who says yes and no in the right places at the right time. Arsene Wenger gets away with it because of all the journeymen on the gravy-train, he is probably the most palatable. And after watching Andrew Mariner’s performance at Stamford Bridge when he gift-wrapped Chelsea a point they didn’t deserve, how can anyone ever take football seriously again? This is not only hyperbole, its just wrong. How would Wenger have “wasted” huge resources, when in fact he for many years had the least net spend of any top team. In fact lower than teams like West ham and Villa? Secondly, why should Wenger have been “imprisoned” for having Diaby and Bendtner? Would he first have been knighted for cultivating say Anelka, Fabregas or Ljunberg or Kolo Toure or Wilshere? Which one? Or perhaps neither is more appropriate? Why the hype here? Is it really necessary? Please note the “massive waste” on Bendtner was like a few hundred thousand pounds paid to FC Copenhagen when he was like 16 yrs old. And then a salary less than Danny Welbeck earns. Note as well that in the upcoming world cup only one of these players is likely to be in the starting lineup for his country. And its not Wellbeck. Not least, Diaby’s career was clearly been savaged by the criminal assalt on his ankle. Its fairly cheap shot to critisize him for that. I would have liked to see you stand up and get your ankle broken in two places and then have people claim it was your fault for being injured. That Sunderland game was brutal and many players would have hidden – Diaby didnt. He gave his all, he was never intimidated and paid the price for it – apparently pearls before swine judging by the response from some “fans” of Arsenal. And for all that, if Diaby manages to get back from injury and plays the second half of the season, he would be an automatic lock to go tot he World Cup – that is how much he is respected as a talent. But here we have Arsenal “fans” claiming Wenger should be fired for believing in Diaby and standing by him. Arsenal have not had a lower spend than West Ham in my lifetime, and I doubt ever. Okay, not West Ham, “merely” 18 other premiership clubs over nearly a decade leading up to 2011. Got more red herrings to peddle, then? sorry mate, your argument doesn’t stand up for me. Whose responsible for the spending? The manager, who once replied that if he were given £100m to spend, he would give it all back..So if we have a lower net-spend than clubs like West Ham and Villa, it’s not because we don’t have the resources, it’s because Arsene Wenger believes his squad can’t be strengthened or improved. Should he be exalted on high for unearthing Anelka, Fabregas, Ljungberg, Kolo Toure and Wilshere? Of those five players you refer to, it could be argued only Ljungberg and Toure contributed to a sustained successful period. Yes Anelka was part of the first of Wenger’s ‘Double’ winners, but his ego got the better of him. Arsene Wenger deserves credit for getting a whopping £23m for him, but overall, his career hasn’t been brilliant. The emergence of Fabregas coincided with the start of Arsenal’s barren run, and it was a mis-calculation to tactically channel everything through the Spaniard, ripping up that which had worked magnificently for eight glorious years. Whether Fabregas is the real deal is open to debate, but the whole project largely failed. Outside of Arsenal Freddie Ljungberg was exposed as very ordinary, but the sheer quality around him took his game to a whole new level, and he definitely qualifies as one of Wenger’s successes. Ditto Kolo Toure. As for Jack Wilshere, at this moment in time he represents great potential. If and when he acquires the ability to be a game-changing match-winner, then he’s arrived. Briefly on Diaby, Wenger bought him as a crock from Auxerre, where he played six games in two years. He can hardly string two or three games together without crumbling and sustaining yet another ‘long-term’ injury. Wenger gave him a generous new contract whilst he was recovering from a long-term lay off, and his contribution to our failings of the last few years has been virtually non-existent. There are people starving in his African culture, and he is happy to steal in excess of £50,000 a week. The only two things I remember about Abou Diaby is his fantastic goal against Liverpool when we were robbed at Anfield in the CL, and his bizarre own-goal against Man Utd. Arshavin qualifies as a huge waste of resources too, but there are many more. From an investment point of view it is ludicrous to single out single players as “bad buys” or a “waste of money” . That train of though is perpetuated by the idiots in the football press, who trawl out nonsense on days that nothing is going on and they have no creativity to come up with material for articles. If you are investing, you follow a policy designed to bring you a return, knowing that some will outperform and others underperform. What you’re interested in over all return. That’s what happens you you follow a youth policy in football – you are buying and developing talent aiming to get a few big hits and overal a solid return. You know some will come to no good, but that’s fine. Its the overall return the policy that matters. So again its utterly pointless to start trying to lynch Wenger for Bendtner while saying nothing about Wilshere or Fabregas or Gibbs etc. And the Diaby thing is just beyond low by those who do it. – You have heard about this thing called bluffing, right? – If you are looking to define the era properly, you’d start with the point where Dein and Fisman started letting the likes of Edu and Wiltord leave on free’s. They were clearing the decks for the youth era. When Vieira was not given another contract and shipped off, that opened the room for Fabregas. The “barren run” was not a result of fabregas, it was a result of Arsenal’s long term policy to shut down the taps on spending. Similarly if you think “everything” was being channeled through Fabregas, I do remember a very balanced midfield of Fabregas-Rosicky-Hleb-Flamini coming fairly close to winning the league, and then Arsenal also being close to League Cup wins twice in that “barren era”, but hey I wouldnt want to spoil your gloom and doom view of the world. Plus wasnt fabregas leading the premiership in total assists over a three year period, even a year after he had left and was playing in La liga? Clearly he was getting the ball for no good reason, right? *Apologies for a couple of typing errors that appear at the end of the first line, and again between O’Neill and Keane. Cheers. You seem a decent sort, so I removed the typos for you. Much obliged, Phil, thank you. Interesting article. The whole AKB/WOB thing bothers me for two reasons. Firstly, it seems like a way of dividing the Arsenal fanbase into two distinct camps, who will turn on each other, when they should be united as supporters of Arsenal. Everyone has their own individual opinion, but there’s no need for the kind of vitriol that’s often seen on Twitter between Arsenal fans. Secondly, I don’t like that people’s individual opinions are being generalized and they’re being categorized into one group or another – football opinions are often a million shades of grey, so why act as if they’re simply black or white? Personally, I have supported Wenger through these last 8 years, but that doesn’t mean I always agree with Wenger supporters or that I always disagree with those who would prefer a change of manager. So, therefore, I refuse to recognize these ‘AKB’ and ‘WOB’ acronyms (both ‘groups’ were named by the other ‘group’ btw – just think about that for a second). I will take people as individuals, not stereotype them into groups and listen to what they have to say. Those who are truly in the two extremist camps have no issue with the labelling, as you will know from twitter. Vieira was sold to Juventus because he and Fabregas couldn’t gel alongside each other in midfield, but we were compensated for Vieira’s departure by having Gilberto. The summer of 2006 was the one that defined the next few years, not just because of the stadium move, more because of the heavy-weight departures that weren’t adequately replaced. Most forward-thinking clubs would use the painful experience of losing a CL final as a spring-board to re-group and go one better next time around. It’s almost as though after the defeat to Barcelona in Paris, Wenger surrendered, because Arsenal have never looked like winning the CL since. The defeat at The Emirates against Bayern Munich in February mirrored that against Man Utd four years ago in the CL semi-final 2nd leg. Completely outplayed and out of our depth. The 4th richest football club in the world, and not one solitary European Cup on the club CV. Approaching 100 unbroken years of top-flight football, more time than either Man Utd or Liverpool, yet they are seven and five titles ahead of us, as well as multiple European Cups. As a club, Arsenal have massively under-achieved because of poor decisions made at the very top. In 2006, Dennis Bergkamp retired – an unused substitute in Paris!!! – and Robert Pires was allowed to leave. It marked the end of the natural winger at Arsenal, it’s been make do and mend and a succession of square pegs in round holes, which for a while included the 6’4″ Dane, Nicklas Bendtner. Even the current incumbent Theo Walcott divides opinion and has failed to convince many Arsenal fans. The loss of Bergkamp was immense, the loss of the visionary genius and total-football. Tomas Rosicky arrived from Dortmund with a quality reputation which hasn’t manifest itself over a consistent period of time. And to not properly replace someone of Pires’ ability is tantamount to neglect. Thierry Henry hardly contributed the following season and left a year after Bergkamp and Pires. Eduardo was quality his Arsenal career was far too short, and the leg-break at St.Andrews with Gallas’ on-pitch melt-down led to the implosion of what should have been another title, the one of 2008 you refer to. That’s something else Arsenal lost with the departure of world-class players, the nous, the cutting edge and artistry, but most of all, the guts for a fight in the big games when it really mattered. But for all the financial restrictions that may or may not have hindered Arsenal’s progress, the real reason for Arsenal’s failings have been through a lack of intelligence and bravery which has to come from the core of the club. There’s a reason why Bayern Munich, Real Madrid, Liverpool, even Ajax, have multiple successes in Europe, and there’s a reason Arsenal don’t, and it is far too convenient and simplistic to blame it all on money. I know you continuously disbelieve me when I saw that Arsenal are not the 4th richest football club in the world. How about we ask Phil whether that is true? Primarily I support Arsenal through my love of football, and regardless of their financial standing compared to other clubs, they are one of the biggest clubs in world football, and from that perspective alone, they have under-achieved. Maybe WATA.. Or they have overachieved to be considered one of the biggest clubs in the world. Hard to say really. Anyway. I was just pointing out a factual inaccuracy in your statement. I would hope that would have some bearing on your thinking, but if not, it is still your opinion and that is valid. Personally, I feel we can be bigger than we are, and that is the direction we are moving in. If we had over-achieved, Shard, we’d be like Liverpool and Man Utd – far more titles, and multiple European Cups. As we’ve been recognised as one of the world’s biggest clubs since the 1930’s, we have definitely under-achieved. Of course we can be bigger than how we are currently perceived, but that will only happen with on-field success, that’s how giants like Real Madrid, Barcelona, Bayern Munich, the two Milan’s, Man Utd and Liverpool earned their reputations. RvP is a case in point. He didn’t leave Arsenal for money, he left because Man Utd represent everything Arsenal should be, a genuine European power. Arsenal have a lot of catching up to do, and I doubt that will be achieved by the current manager. ManU have 20 league titles. Liverpool have 18. Arsenal have 13. If you want to consider that we’ve been at it since the 30s, Man actually began their title winning in 1907. Way before we did. So they should be ahead. Both theirs, and LIverpool’s trophies have also come in a golden period. As is the cyclical nature of sports. Liverpool in the 80s and ManU in the 2000s. 13 years ago, ManU had 12 titles, Arsenal had 11. Barcelona were considered giants even when they hadn’t won a single European cup prior to 92. Benfica, Porto and God knows which other clubs have won European trophies but are nowhere near to being as big a club as Arsenal, because they haven’t been sustaining that triumph. Even ManU had more marketing than substance on their side in the mid90s when I started watching football (Which was a result of the work they began in the mid 80s). But that market growth allowed them to lay the foundation for sustained success. That is what Arsenal are doing for the past 10 years. Laying the platform for sustained success so they can keep being known as a big club. Mismanagement and under-achievement are words without meaning unless it’s something specific and contextual. Arsenal are where they are, and they are a big club because they have done well. Of course they can do better, but if you think Arsenal could be where they are if they had been truly mismanaged, then you are being very very ungracious to the club you support and all that has gone into making us who we are. As for RVP. You can project whatever justifications you want on him because there is no way of knowing what he was actually thinking. WWII effectively ended the Chapman legacy at Arsenal, and the club have struggled to get it right ever since, only finding success in short sporadic bursts. It doesn’t matter when Man Utd or Liverpool won their first titles (we we formed before Liverpool), we have spent more time in the top division than both of them. It took 46 years for Arsenal to win their first major trophy, far too long. The 1950’s and 1960’s were largely forgettable from an Arsenal perspective, but Bertie Mee re-ignited the flame in the early 1970’s with European success followed by the ‘Double’, but he couldn’t sustain it, and had to go in 1976 with Arsenal heading in the wrong direction. Decks cleared, how about challenging the emerging force of Liverpool, we certainly had the resources and structure. How about getting a really exciting dynamic manager that can take us up a level, like a Bobby Robson, who was doing exactly this at Ipswich? No, Arsenal went for the safe, lazy option of ex-club stalwart Centre-half, Terry Neill, who had almost took Tottenham down. Best remembered for taking Arsenal to four finals in three years and winning only one of them. Not a brave inspired choice. Then for some unfathomable reason, we had two years of Don Howe before another ex-player George Graham restored some pride, and gave us that magical night up at Anfield in May 1989. Another title – with only one league defeat all season (2-1 at Stamford Bridge) – and European success! But his brand of football was turgid towards the end and was stinking Highbury out, which is when he blotted his copy-book and was quite rightly sacked. But the tradition and standing of the club with its classy Marble Halls, has never been in doubt, The Arsenal have always been highly regarded world-wide, largely because of the foundations put in place by Herbert Chapman, but also because of the Board of Directors which for decades has been made up of Old Etonians with links to royalty. Essentially, what Arsenal have done since the stadium move, is make considerably wealthy people even richer without delivering anything of real substance on the park, and for that, Arsene Wenger is culpable. That has to be one of the most absurd arguments I’ve heard about Wenger’s ‘culpability’. Rich people get richer, as a general rule. What is Wenger supposed to do? Rob the bank accounts of the Hill-Woods and the Bracewell-Smiths and use that to sign players for Arsenal? The fact that Arsenal are getting richer and are ‘worth’ more through the continued CL appearances, the stadium, the training and medical facilities, increased sponsorships etc is of never no mind to you. You’d rather bemoan that someone else got rich in the process. If all they wanted was to get rich, Usmanov had a higher price to offer all of them. Only Dein took Usmanov’s money. They have also not taken a dividend through the years, again something they had full right to do. The salaries they draw are entirely comparable to the industry standard, sometimes less. So while money is an obvious motivation, it cannot have been the sole motivation. Yes, who knows how it would have turned out if Arsenal had appointed some other managers instead of Neill or Howe or Wenger? But the fact that we’ve still managed to stay among the elite of world football through the ages, doesn’t just happen through chance. Suggesting otherwise is ridiculous. God. I should know by now to not get into it with you, but seriously, you are one weird man. You don’t like the history of Arsenal, except Chapman. You don’t like the present. You don’t like where we are headed. You don’t like the guys who ran the club through all the years. This is only on the basis of your statements. While you quite obviously are passionate about Arsenal, do you even like anything about the club you love? I used to enjoy going to Highbury,Shard, standing in the North-Bank with thousands of like-minded people who all wanted the same thing – a nice home win and ultimately success for the club. Success used to mean bringing one of only three – four if you’re in Europe – of the available pots home, now, forget the cups, fourth place in the PL is the golden ticket, celebrated as if it were like winning the CL itself. It’s okay not to win cups because we’re making the numbers up in Europe’s elite competition. Is that the line now, Shard, now that The Emirates is mostly hosting an altogether different more intellectual, more enlightened class of supporter? A far more forgiving free-thinking supporter who embraces the taking part far more than the actual winning. I liked the 1970’s plain red shirt with white sleeves and single cannon facing the opposite way to the new crest. There’s plenty I like about Arsenal, I’ve been supporting them over 40 years since I was a little boy pretending to be Charlie George, but as any true football supporter will tell you, once you’ve found your spiritual team, there’s no way from that day forward you can ever opt out, or choose another team. Your team is embedded in your soul, but it doesn’t mean you have to whole-heartedly agree with the way the club operates, or swear alligience to any given manager you don’t particularly rate. In my life-time of supporting Arsenal I’ve had to sit back and watch Liverpool race away from us in the 1970’s and 80’s, and more recently, Man Utd. Had the right decisions been made at Boardroom level, it could have all been avoided. So yes, I love Arsenal, but my bone of contention is that for the last 40 years the Board have handicapped the club with their managerial appointments, and the club hasn’t been administered efficiently enough. I wasn’t around in the 70s WATA. So whether those were the correct decisions/appointments etc I do not know, since the context is beyond me. What I do know is that I am an Arsenal fan, living half way across the globe, and there are millions like me. That would not be the case if Arsenal had had 40 years of mismanagement. So, whatever the flaws, they must be doing something right. In fact, doing more right than wrong. And your complaints about the changing nature of fans. Oft heard, and like anything, times change. I’m not sure the 70s were as special as you remember them to be. It was a different world, but you were also looking at it differently. Nostalgia affects how we remember things. I’m not discounting that it was better in some ways. It was also worse in other ways. It was just different. That it appealed to you more isn’t an objective argument for Arsenal getting things wrong. Although it explains your displeasure. Anyway. Hopefully you’ll rediscover the joy of watching Arsenal soon. Hopefully, Shard, although I have to say from the conception of the Premier League and traditional football clubs that were once the hub of a thriving community becoming the new toys for billionaires, football has lost its soul. Everything has become so sanitised, and with bungs and brown-paper envelopes, all the nonsense of in-game betting, no-one can be 100% sure whether they’re still watching the genuine article. It all has a tacky, tarnished feel about it, and it doesn’t help having a national side that stinks and has been mediocre for years, or not being able to produce any decent English managers/coaches. Football is corrupt and as bent as hell, and a closed shop too, which is why those ex-footballers who don’t become managers but can still string two words together become pundits. Even Countdown contestant Clarke Carlisle has turned up waffling on ITV4. Before his recent appointment as Martin O’Neill’s assistant, where was Roy Keane every time the Republic of Ireland played an international? Sitting with Adrian Chiles, Lee Dixon and Gareth Southgate commenting on England. And what of Harry Redknapp? He single-handedly destroyed Portsmouth, and his spending at QPR over the last 12 months could cost the club a £60m fine. Who are these people that are running our national sport??? Charlatans and criminals the lot of them, and that’s another reason people have fallen out of love with the game. There is no proper professional regulation or accountability. And with the main focus all on the race for the top four in the PL, it has marginalised and condensed football, so that everything outside of those five or six clubs involved in that race is pointless. As an overall product, football has become far less attractive and far too stage-managed. Arsene may or may not be the best or worst manager ever, but he almost certainly manages the club witth the most intellectual set of supporters. Take a bow Shard et all. Truly world class argument, which I have enjoyed. Some great points made by shard and WATA. You two should make a point of meeting up sometime ! A good lively and well informed debate.